I have tested and used a huge number of launchers of all kinds (type-search-run, pop-up menus, category boxes, etc). 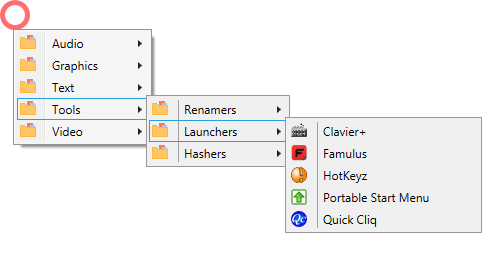 Perhaps program launchers is the category I have most played with (together with hash tools). The ones I like and use most (which I have customized to my needs) are all abandoned now (ASuite, FSL Launcher, HotKeyz, Pretty Run, Quick Pop Menu, etc) but as they still work fine I do not need to switch to launchers still in development (adding stuff would be a time consuming task). Yet when I come across a new launcher which seems to be interesting I usually give it a try. Several days ago I stumbled upon a brand new tool- Biniware Run, I did a brief testing and I found it useful even though it is first public release (published on 2018-12-12). I expect that the program will get polished in future releases (I might suggest some improvements to the developer) yet I suppose that in its current state it might be beneficial to some users. Biniware Run is a friendly, colorful and easy to use software which provides you fast access to your favorite website links, files and folders from one single place. Just drag and drop any website link, file or folder inside the colored circle from your desktop. You can easily access all you are interested in by using this handy software. You can define categories, move, sort, import, export or customize your shortcuts anytime. Instead of searching for bookmarks in different web browsers, files or folders through your computer, make your work and browsing easier with Biniware Run. And the best thing is that this software is portable. Even if there is an installer, this is just for an initial setup: folder creation, optional shortcuts, quick overview on how to use it. The installer will just extract one executable file and that's all. Want to get rid of it? Simple. Just delete the file. Easy to use and customizable user interface. The shortcuts are displayed with their own icons. Drag and drop support for website links, files and folders. Shortcuts to .exe, .cmd, .bat files support parameters. Custom image support. The user can choose a custom image to be used instead of the default colored circle. Supported formats: .ico, .gif, .png. 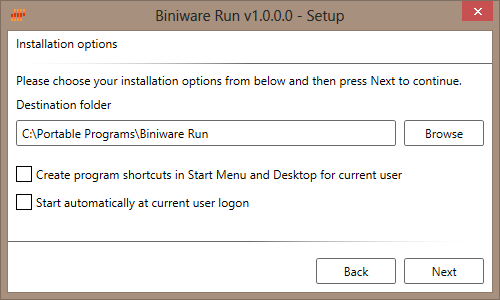 I consider Biniware Run (as of version 1.0.0.0) a fully functional program because the features unlocked after donaton (see Registered Users Features above) have no impact on program usability. 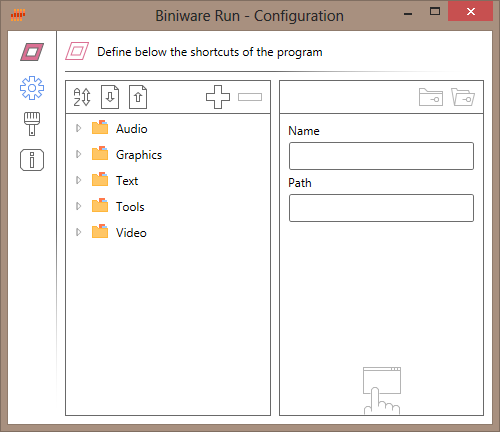 Biniware Run is written in C#. Biniware Run is tiny- the installer is 130 KB, the executable is 158 KB. Biniware Run is relatively light, under Windows 8 x64 it uses about 13 MB of RAM. Biniware Run is stable- during my tests I did not encounter any problems or crashes. For me adding categories is a bit tricky and unhandy (if I am not missing a simpler way to do that)- add a new shortcut, select a folder, delete path, enter name for the category. The developer- Alexandru Dicu, is the author of the popular program Windows Firewall Control (mentioned here) which was sold to Malwarebytes this year. 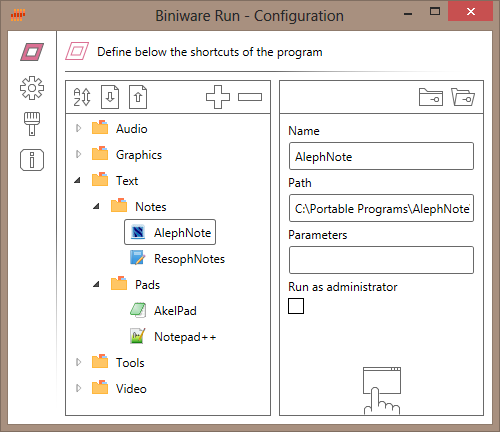 Note that Biniware Run no longer creates an empty folder in AppData. Since custom icon support was removed now it is totally free. The only difference between the unregistered and the registered versions is the special thank you in the About section. To create a category, just add some child nodes under your node. The latest version (1.1.0.0 ) is a huge improvement over the initial release (1.0.0.0)- now the program is fully portable, more customizable and even easier to use. What is the point of this meaningless post? Aren't you the one constantly riling against censorship? What's with the policing of my simple statement of appreciation? I don't post anything I don't mean. smaragdus wrote: ↑ Such posts by moderators cannot conceal the fact that the forum is dead. I get your disappointment, I been wishing the forum was more active, too. I take part of the blame, since I haven't been posting as often as I used to, but IRL got me stuck. I'm aging, too, and haven't gotten any wealthier, much to the contrary, so I have to toil harder. But no, TPFC isn't dead, even if there's only crickets in the forums, rest assured. Computing is changing, everyone is going mobile, PC sales have slumped, and the Windows 10 user nightmare doesn't help, but as long as people have to work in MS environments, TPFC won't die. Trust me on this one. Such posts by moderators cannot conceal the fact that the forum is dead. We are definitely down on overall forum activity but we still have good site visitation numbers and, at least for me, portable software is solving problems on a daily basis. Once it stops making my life easier, I'll certainly move on. As to this program, I tested it and unfortunately had some kind of error on Win10. I was going to try and retest in the week ahead. I was not asking you but Midas. Or you have founded a moderators' party? Your post quenched the faint enthusiasm I still had to publish content here. I have already stopped posting at the comments section after Andrew Lee ruined it. I will stop posting in the forum too since it is a waste of time. When I publish a review I do not need any appreciation. I expect either no comments or relevant comments. I consider single word posts like 'Good', 'Nice', 'Great', Excellent', 'Thanks', etc irrelevant as they do not contribute to the discussion at all. As a precaution against such meaningless posts some forums do not allow such short comments. I also do not expect to be called bratushka (here) and comrade (here)- until now I was keeping silent about this nonsense because I don't have time to waste but I will not tolerate this any more. When I post a review I try to keep the quality high (testing the reviewed program, taking screenshots and uploading them, generating hashes, checking links, building lists of similar programs, etc) but this is a waste of time as here in the forum quality no longer matters- after the good posters (in alphabetical order- I am Baas, joby_toss, lautrepay, etc) left the forum the quality of the posts is mediocre at best- Midas and webfork keep pushing untested software, commercial software, Electron software, in most cases they don't even bother to take their own screenshots, their posts are often inconsistent. I no longer want to be part of such unhealthy environment. Your post was the straw that broke the camel's back. Thank you very much. In my review I published a link to the forum. Your post is just another example that the meaningless posts are prevalent in this forum. What censorship and policing are you talking about? I just asked a question. I did not understand what was nice- the weather, the moon or something else. Perhaps you are trying to catch up with webfork's posting record? I have had enough of such trash. So thank you too- the moderators (billon and Midas) became my liberators- I have a huge list of programs to review in the future but I will not do that- the moderators managed to exhaust the remnants of my zeal. Being called bratushka and comrade also helped a lot. Thank you very much. Please delete my account and all my posts. Let me state clearly that I do not want to see you go, smaragdus. I really appreciate the work you have been doing here and I'm sure everyone agrees with me on that aspect. While I strive to abide by community rules, I talk only for my myself. If you think you can do a better job at moderating TPFC, I'll be glad to relinquish the post. Otherwise, I regard the whole issue as an excuse to excuse yourself from a commitment that has grown burdensome over time, while bashing others for not standing up to task. Have a happy new year -- and, should that be the case, a happier life away from TPFC. smaragdus wrote: Please delete my account and all my posts. You've put hundreds of hours of great work into the site, making that disappear would disable a lot of very valuable, well-research tools and resources. I hope you change your mind about their removal. The truth is we've had a lot of intense and opinionated people over the last decade and we need them. They take up the mantle of what is kind of a strange, often thankless project. It's worth the trouble: the programs we highlight by very smart devs get the word out to thousands of people and make people's work on computers less crappy. The rest of the web as I see it right now does bad work with barely transparent article-as-sales-pitch posts and "reviews". Smaraguds in particular has done exemplary work over the years with terrifically complete posts about OSS and freeware that rival 95% of software home pages for detail and background. It's not just TPFC: Smaragdus' work on github has also been very solid, helping developers with suggestions and feedback. Several programs I use on a daily basis are better because of his efforts. I very much disagree with any suggestion that Midas is doing a poor job as moderator but I share some of smaragdus' frustrations with the site and his criticisms of my work are valid. We've had a number of conversations about it over the past year but I wasn't able to address some of his fundamental concerns. I'm sad to see him go.